Last week, it was Cornwall. After that, we were divided whether to go anywhere for New Year or just sit and pass time. Plans were made, initially for Scotland but because of the distance and potential weather problems(North England is flooded), it was discounted. Then, we planned for Wales(Snowdonia), with a halt at Birmingham and at Cannock for a shop by name Wheelspin Motors, one of the largest RC shops in Europe. While charting out the route, I found that Powis Castle is enroute and included it in the plan as well. After a big chaos as to who should be the drivers, we start from the place only by 8:30. It’s a straight stretch of road to Birmingham on M40 and we reached Birmingham by 10:30. 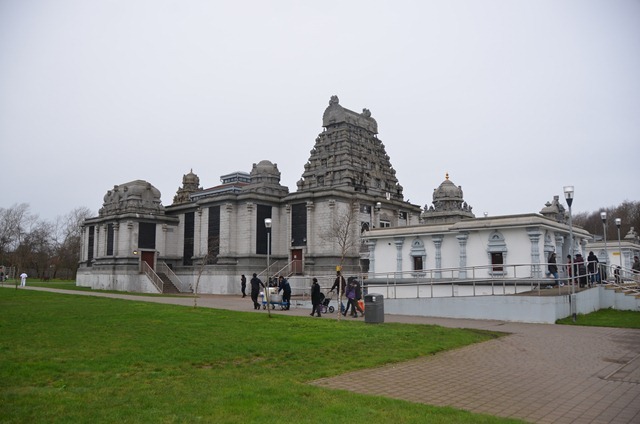 A visit to the temple and breakfast there, we are out in an hour and a half. It looked like it rained heavily the previous night and management of the car was a big trouble in the parking lot. Arul tried to help someone whose car is stuck in the mud, the car came out, but the mud thrown by the rear wheels would have made the owners of two cars very angry. There were three Christians in the group and unhappily, no church was available for them in the vicinity to pray. It was already later than the planned time and we skipped the shop for the chagrin of two. Next was to Powis Castle. What I knew of Powis Castle was that that is the residence of Robert Clive, one of the founders of East India Company rule in India. But, actually, it turned out that his son was married into the family owning the castle and it’s the loot of the father and son from India(Robert Clive lost £300,000 in a single sunk ship in India and over his corruption charges, he stated in Parliament, “I stand astonished at my own moderation” and his son, Edward was the Governor of Madras when Srirangapatnam fell and looted) helped the original owners tremendously in renovation of the castle. 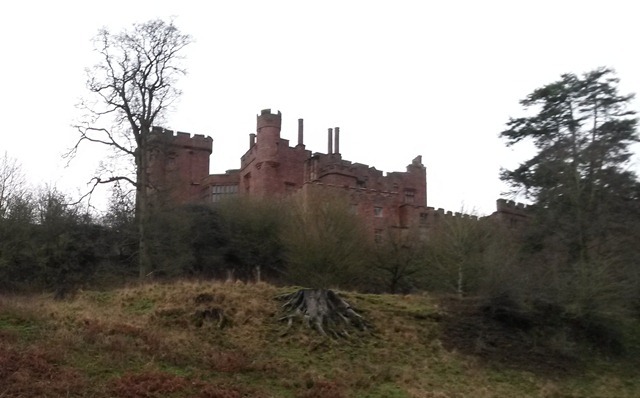 The original castle is one of the very few standing Welsh fortresses, headquarters of the Kingdom of Powis. The rulers declared vassalage to British Crown and operated under the title Baron of Powis, with the castle and the title sold to the Earls of Pembroke. It was the Clives who married into this family and the collection of the father and son is housed there. It includes, bare minimum, a piece of Tipu Sultan’s throne and a tent of his. We parked at a wrong spot, because of which we had to walk the whole length of the park. Though the climate was damningly cold, it was an excellent walk through a deer park having a few peacocks and some fine landscape. It turned out that the castle is open only on weekends and had to turn back just after a view of the walls. Though Powis is a part of Wales, the real Wales feel will start only once you cross this area into the historic Gwynedd, currently covering Snowdonia and anything further. Four things are stark – narrow roads, sheep, water(we being in the flood season, when much of North England is flooded, there were cases where we saw some flooded villages) and the sign ARAF(meaning Slow in Welsh) on roads. It was a beautiful drive into the hills and our target was to cross Snowdonia before nightfall. Well, we were bang in the centre of Snowdonia when darkness crept upon us, with nothing to eat and only with a GPS in hand. Driving all along bypassing Harlech Castle which was visible in the dark from afar, we hit a local pub where we had a nice lunch(if you call the meal at 6 PM a lunch!!) and moved to the hotel for the night. Beside the regular night fun, we had an outing to Caernarfon and got ready for the next day. We had no information at that time, but it looks like had we advanced twenty miles ahead, we would have seen Northern Lights, a very rare chance for any Indian based in India. 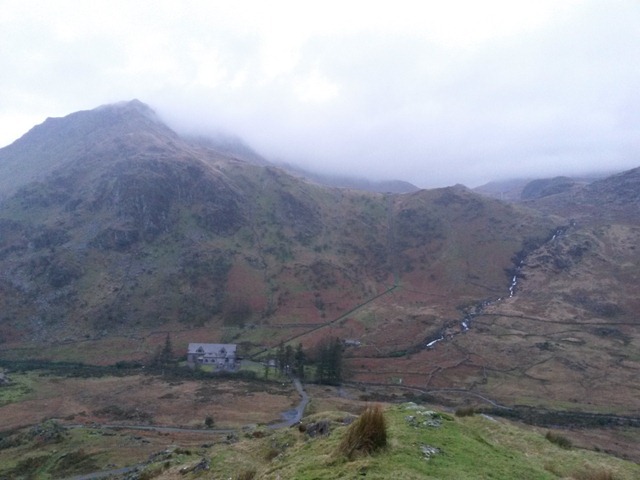 The next day was dedicated exclusively to Snowdonia. The first spot was by a river, with a waterfall and a railway line in the background. After a photoshoot, we moved to another spot, this time by a lake. By then, we understood that every parking spot is a photoshot stop and we did the same a few times till we started feeling hungry, the main ones being the one facing Snowdown, Snowdon Visitor Centre where we unsuccessfully hunted for a breakfast and a riverside viewspot. The first one gave the real feel of winter cold for the first time. Standing at the edge of a cliff, you will be seeing, I think, Snowdown, with a waterfall, a lake on one side, a river at the bottom and a small village, a perfect picture postcard opportunity. The second one, we stopped for meals, the counter being closed by then(we did a short stretch of walk there) and the third was one of those innumerable photo spots in Snowdonia. I thought that we will be out of Snowdonia by two or three but, due to the lack of place to stop and the small size of the general area, we were out of Snowdonia and reached Llanberis by 11:30 for breakfast – just a four hour trip. Breakfast done, we made a move to Caernarfon for the castle. Entry was £6.75, cheaper by English standards for the stuff present inside. there is one big museum over a local military battalion and a small theme museum. This is the fort where the story of Prince of Wales started. After ambling for a while, catching the coastal expressway, we aimed for Llanfairpwllgwyngyllgogerychwyrndrobwyllllantysiliogogogoch, the place with the longest name in Wales. Enroute, we had to cross the ‘sea’, may be, some 250 metres wide and with a house in it’s midst. One photograph and we were off towards Llandudno. It was just 3:30 by the time we neared Conwy. To pass some time, we decided to go towards Swallow Falls, planned for the next day. After cutting through some dangerous roads and excellent views, we reached the spot by around 4:30, pitch dark, just after Betws-y-Coed. Well, there was no board anywhere telling us where the waterfall is and after a confusion in the middle of a jungle, we decided to proceed further without the GPS. We reached Bangor, where we reset the GPS to lead us towards the hotel. Everything done, time for Indian dinner(good food, but pathetic service) and an stroll out by the sea side along the promenade. Since we have nothing left to do the next day, I had to sit and chalk out a new driveway for us. Next day, we planned to pass some time in Llandudno itself – it’s a good shopping spot and some places to see around. 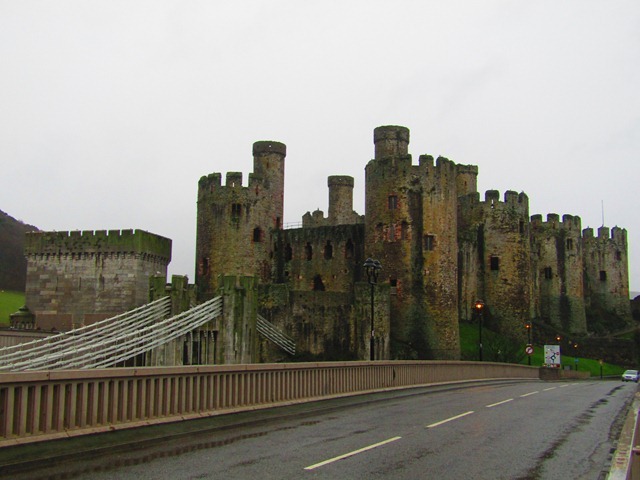 But, rain, compounded by a long weekend forced us to start from the place, this time, to Conwy Castle. 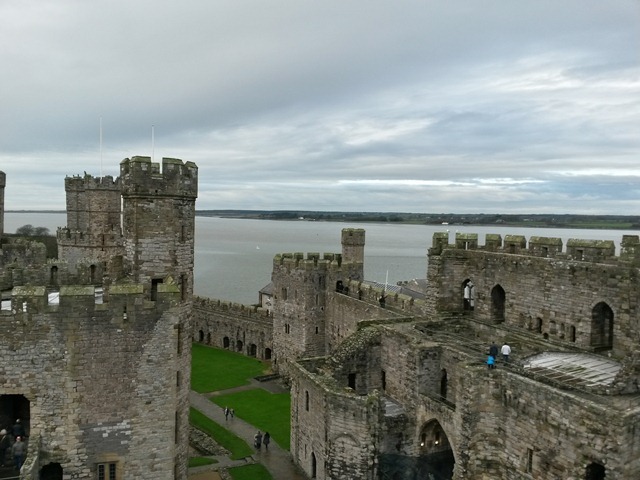 Since we roamed around in Caernarfon Castle, we didn’t think of entering the castle. The narrow lanes out of Conwy is a nightmare and due to the fear of similar roads and fuel situation, we started by skirting Snowdonia to hit A5 passing through B5427 and B5113. 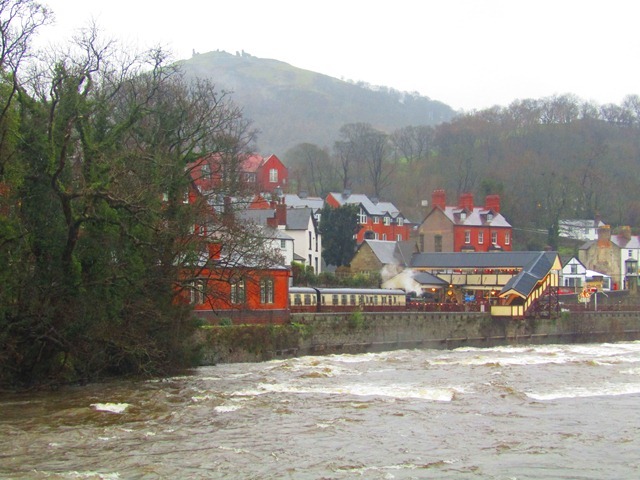 The last stop in Wales was at Llangollen and it was because we saw a River Dee swollen and bursting. Once we are out, we tried for Cannock again, and for our bad luck, the shop was closed again – this time because it’s a Sunday. By the time we started from Cannock, it was already 3 and there is no point stopping in Stratford-upon-Avon or going to Cotswolds, forget Uffington for good. When nearing Heathrow, at one point, we were in the line of the runway and the view of multiple flights queuing to land looked just like steps from the sky – it was five or six flights in line at different altitudes in total. End of a great trip with one of the best drives views in England(note, England) but with a few takeaways – if you want good views and drives, hit the B Roads in Wales; stay on Powis side of Wales since that gives you all day views of Wales, with the second halt somewhere on the other side of Wales or inside Snowdonia and last but not the least, plan ambitiously but don’t target to complete everything.